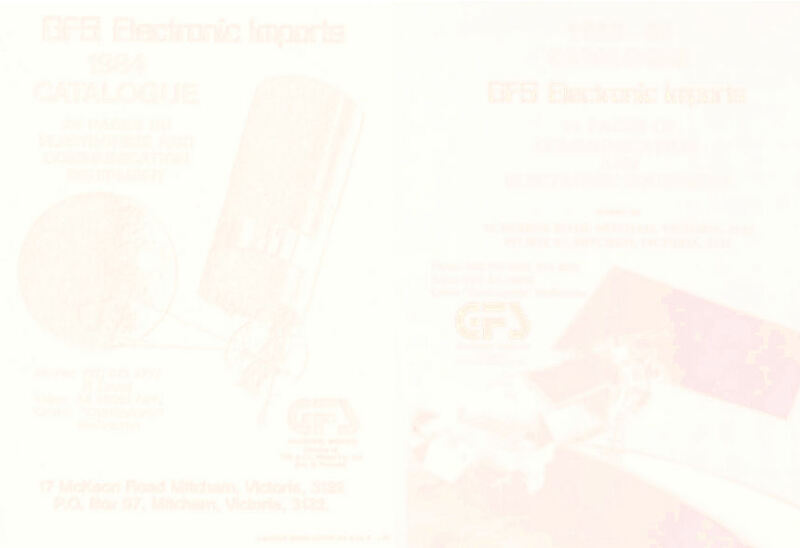 MFJ Enterprises manufactured a very large range of communication accessories as can be seen from the pages above and below in GFS Electronic Imports 1984 catalogue. 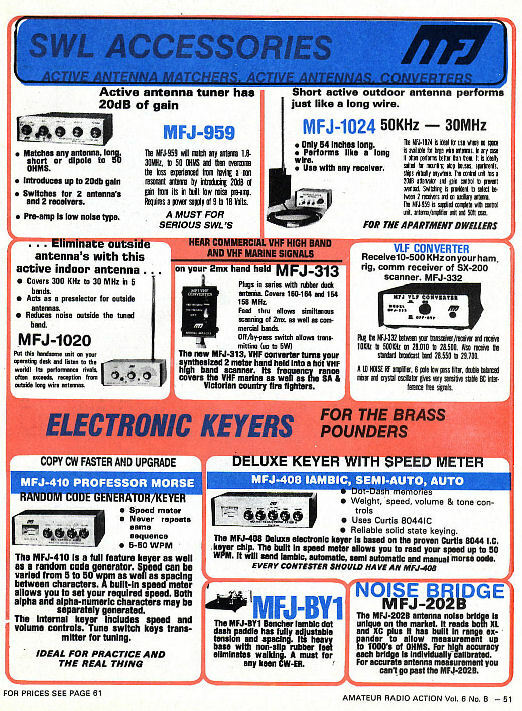 Some of these products included electronic morse code keyers, active antenna tuners, active antennas, converters, dummy loads and antenna noise bridges. 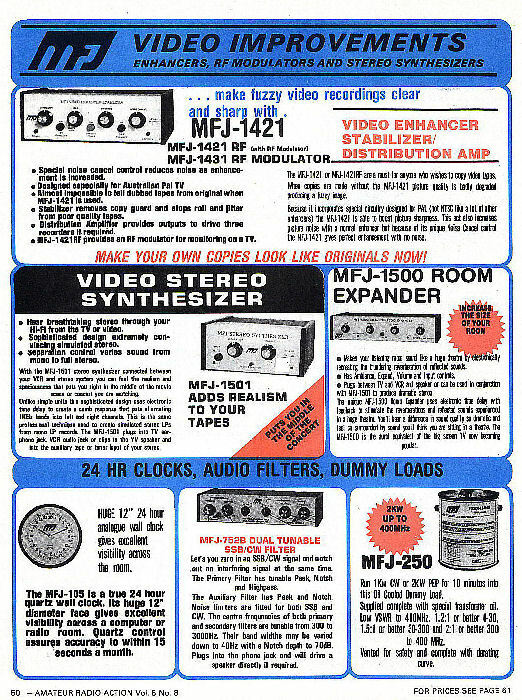 In 2010 MFJ Enterprises are still manufacturing and marketing a very large number of communication related products. 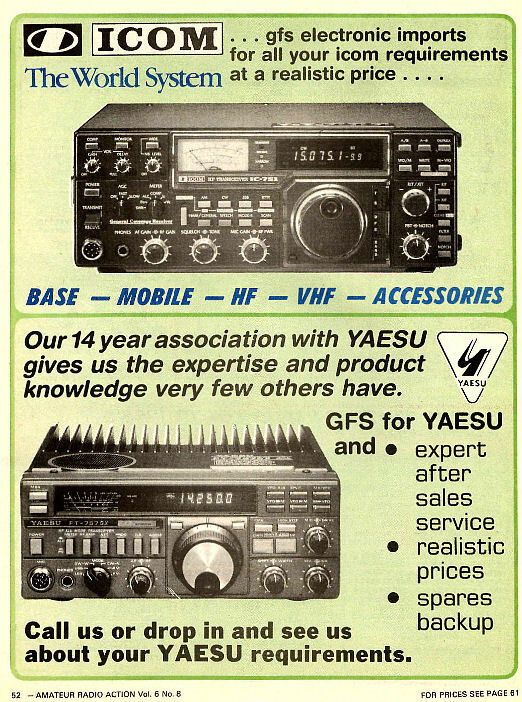 Although not direct importers of the products in 1984, GFS Electronic Imports sold both Icom and Yaesu amateur radio equipment to Melbourne radio hams, as can be seen from the catalogue page above. The popularity of VHF/UHF scanning receivers in the early 1980's required a range of broadband antennas to suit. GFS Electronic Imports marketed both directional Log Periodic beams and non-directional Discone antennas for this purpose shown below. During the early 1980's the Tandy model TRS-80C colour computer was popular with hobbyists. 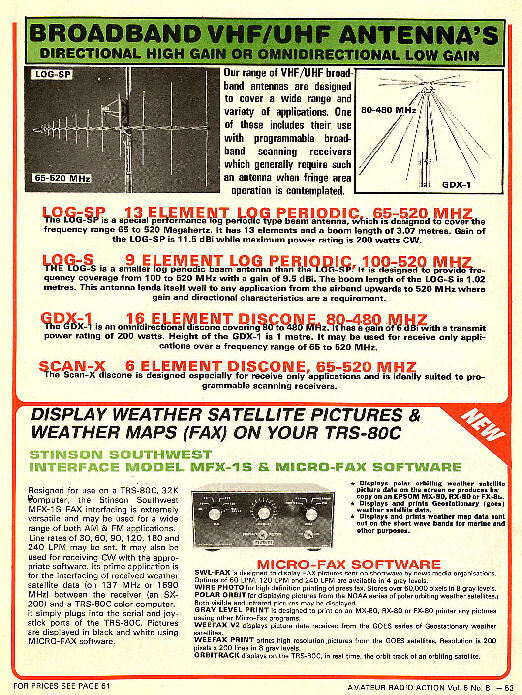 GFS sold an interface for the TRS-80C, the MFX-1S shown below, which allowed it, in combination with a VHF receiver, to display polar orbiting weather satellite pictures of the earth. 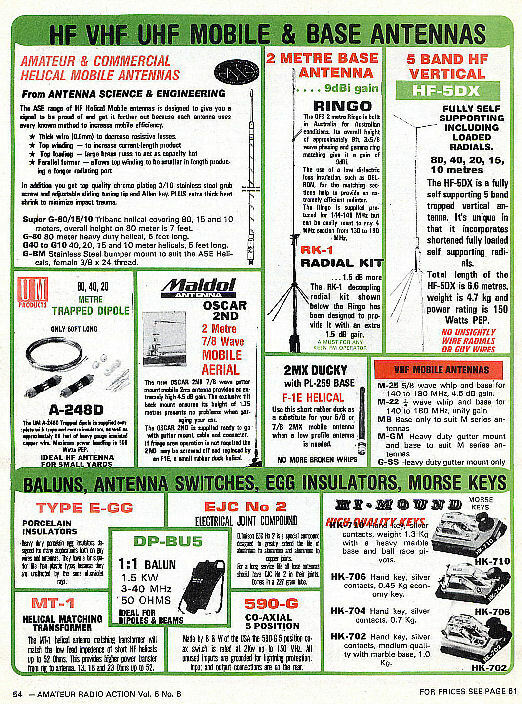 A number of different mobile HF/VHF mobile and base antennas as well as various antenna accessories were covered in the GFS Electronic Imports 1984 catalogue, as seen above. Shown below are the range of Swiss Quad antennas sold by GFS. 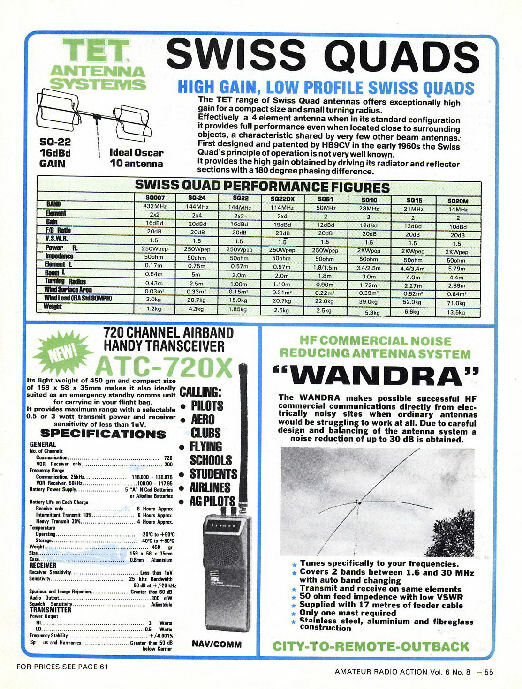 The Swiss Quad was a popular antenna as it provided high gain in a compact package, in fact it had the same gain as a 4 element cubicle quad. GFS Electronic Imports represented a Western Australian company, Antenna Science & Engineering (ASE) who manufactured small helical based fixed station HF antennas. The Wandra, shown above, was a small antenna providing operation on two bands between 1.8 and 30 Mhz. The model ATC-720X was a small hand held Airband transceiver covering 720 channels in the VHF AM airband. The product, shown above, found it's way into the hands of private pilots, aero clubs and other users in the aviation industry.